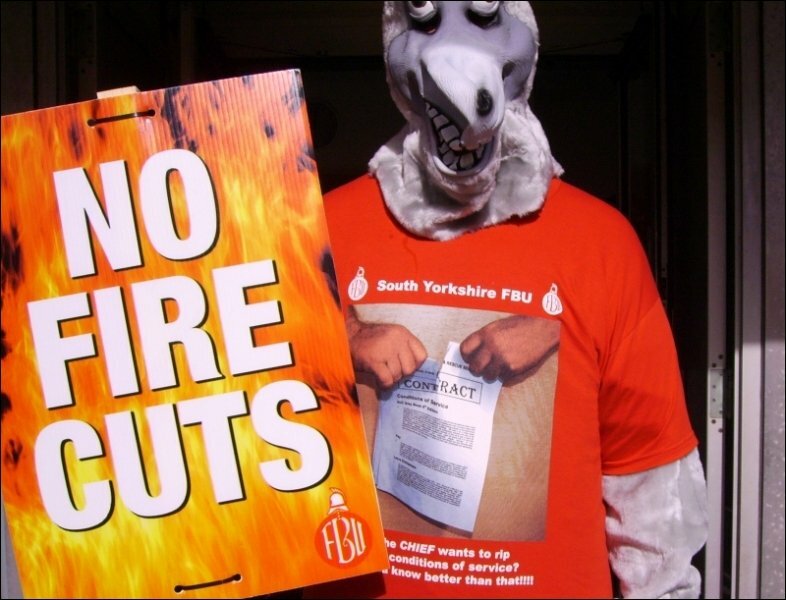 FIRE BRIGADES Union (FBU) members in South Yorkshire have shown strong support during the first of two 24-hour strikes against management attempts to impose new shift patterns under threat of mass dismissals. This gives the answer to chief fire officer Mark Smitherman who said that the union was being led by 'donkeys' and would not get members' support. 83% voted to strike on a 79% turn-out. Six fire stations and five retained stations had to be closed as management could not get enough 'volunteers' to help them run a skeleton service. Lucky for them, and the public, there were no major incidents on the night of 19 October. The fire authority said that firefighters would not have public support. Well the public gave their verdict all night with honking horns and food and drink supplies to the picket lines. "Let's have more of this 'not having public support'" commented one picket at Mansfield Road station. Strikers were boosted by FBU general secretary Matt Wrack and other national officials visiting Sheffield Central and several other picket lines. Correctly, South Yorkshire is being seen as a battleground against bullying management and service cuts. 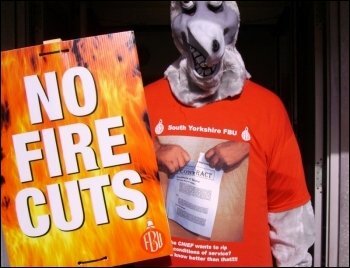 Last month, 2,000 FBU members from all over the UK marched in Barnsley in support of their South Yorkshire comrades. Firefighters don't want the shift changes management want, as they would be detrimental to family life and childcare arrangements and they could lead to cuts in night-time fire cover. But it is the threat to sack 744 firefighters that has really incensed union members. Resolve is strong on the picket lines. Many pickets see the link with the rest of the public sector under attack, especially Royal Mail, and contrast these cuts with the bankers' bonuses and politicians' expenses. The second strike is on 23 October at 6pm for 24 hours.